The fabric from some clothes can melt onto the bottom of a steam iron if the iron is too hot when placed onto the fabric, particularly if the fabric is delicate, such as linen or silk. If not cleaned from the bottom of the iron immediately, the melted fabric can burn and melt further onto the iron, causing staining and the transfer of debris and stains onto other clothes. Unplug the iron and allow it to cool completely before cleaning. Follow fabric care instructions to prevent fabric from melting onto the iron. Wet a stain-erasing sponge, such as the Magic Clean Eraser, and apply it to the bottom of the iron. Scrub the bottom of the iron in a circular motion and remove as much of the fabric residue as possible. Create a thick paste with 1 cup of water and ½ cup of baking soda. Mix well. Use a rubber spatula to apply the baking soda paste to the iron. 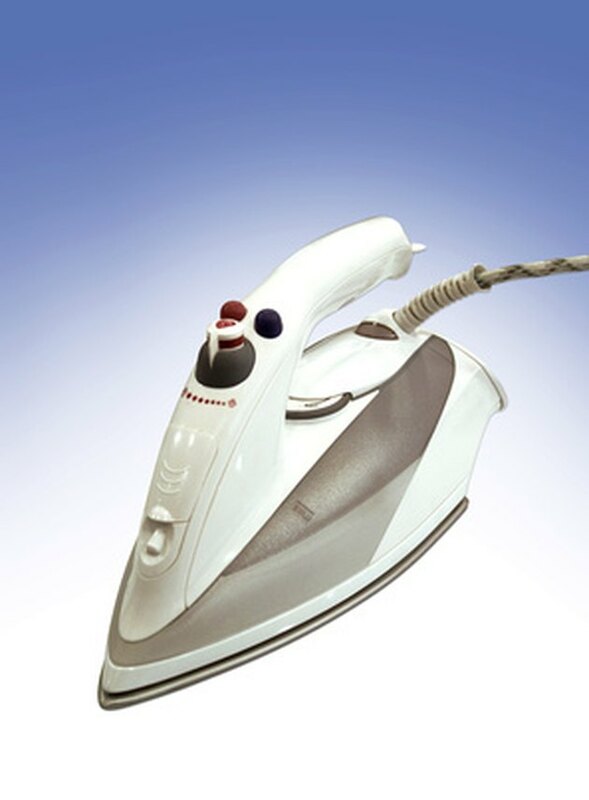 Do not cover the steam holes on the bottom of the iron with the paste. Let the baking soda paste sit for up to 30 minutes. Dampen a clean sponge and wipe away the paste. Rinse the sponge and wipe the bottom of the iron until clean. If there is still fabric on the bottom of the iron, mix together ¼ cup of vinegar and ¼ cup of salt and heat it on the stove or in the microwave. Dip a clean cloth into the vinegar and salt mixture and scrub the bottom of the iron until all the residue has been removed. Wipe the bottom of the iron with a clean, dry cloth. Wait for the iron to dry completely before using it.